My True Love gave to me…12 Drummers drumming. Drumroll please…..Lighting for your tree is the final item that I would like to address in the 12 days of Christmas series. Last year I bit the bullet and bought 2 strands of LED lights for our tree. Then this year I bought an additional strand. They are a bit more expensive than the incandescent lights but they are supposed to last much longer AND be more energy efficient and cooler to the touch so there is less of a chance that I will set the house on fire. (which is something to think about with a 100+ year old house.) What I have found frustrating about Christmas lights is that they (incandescents) never seem to last more than one season. I have a tub of lights in the basement that no longer work and up until now I didn’t know what to do with them. They seem to be made of things that could be potentially dangerous to put in the trash so I found this site that will recycle the lights and send you a 25% coupon to purchase LED lights. So I think after the holidays, I pack up all those lights and send them in and see if I can get a couple more strands for next year. 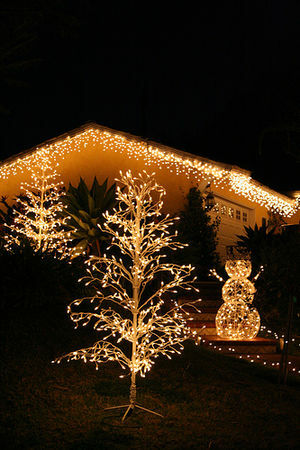 If you haven’t purchased the LEDs and are curious about some of the advantages, the information below came from Wikipedia and while some of it doesn’t really apply to Christmas lighting it is still interesting to note for other lighting uses in your home. LEDs have improved in recent years so that they are a warmer color which most people find more appealing than a cooler color of light. That was the concern I had when I purchased mine for my tree. I didn’t want the lights to look like something out of a sci-fi lab, but to look warm and inviting. Efficiency: LEDs emit more light per watt than incandescent bulbs. Their efficiency is not affected by shape and size, unlike Fluorescent light bulbs or tubes. Lifetime: LEDs can have a relatively long useful life. One report estimates 35,000 to 50,000 hours of useful life, though time to complete failure may be longer.Fluorescent tubes typically are rated at about 10,000 to 15,000 hours, depending partly on the conditions of use, and incandescent light bulbs at 1,000–2,000 hours. Low toxicity: LEDs do not contain mercury, unlike fluorescent lamps. Fluorescent lamps are typically more efficient than LEDs (for lamps with the same CRI). High initial price: LEDs are currently more expensive, price per lumen, on an initial capital cost basis, than most conventional lighting technologies. The additional expense partially stems from the relatively low lumen output and the drive circuitry and power supplies needed. Temperature dependence: LED performance largely depends on the ambient temperature of the operating environment. Over-driving an LED in high ambient temperatures may result in overheating the LED package, eventually leading to device failure. Adequate heat sinking is needed to maintain long life. This is especially important in automotive, medical, and military uses where devices must operate over a wide range of temperatures, and need low failure rates. Light quality: Most cool-white LEDs have spectra that differ significantly from a black body radiator like the sun or an incandescent light. The spike at 460 nm and dip at 500 nm can cause the color of objects to be perceived differently under cool-white LED illumination than sunlight or incandescent sources, due tometamerism, red surfaces being rendered particularly badly by typical phosphor based cool-white LEDs. However, the color rendering properties of common fluorescent lamps are often inferior to what is now available in state-of-art white LEDs. Area light source: LEDs do not approximate a “point source” of light, but rather a lambertian distribution. So LEDs are difficult to apply to uses needing a spherical light field. LEDs cannot provide divergence below a few degrees. In contrast, lasers can emit beams with divergences of 0.2 degrees or less. Blue pollution: Because cool-white LEDs (i.e., LEDs with high color temperature) emit proportionally more blue light than conventional outdoor light sources such as high-pressure sodium vapor lamps, the strong wavelength dependence of Rayleigh scattering means that cool-white LEDs can cause more light pollution than other light sources. The International Dark-Sky Association discourages using white light sources with correlated color temperature above 3,000 K.
Droop: The efficiency of LEDs tends to decrease as one increases current. So look at the list and understand that there is a political debate going on in our country due to the incandescent bulb phase out which is to happen in 2014. Rush Limbaugh and his groupies seem to want to repeal the laws that have been put into place concerning lighting and the CFLs. Yes we are losing jobs due to switching to a more energy efficient bulb, but I don’t believe that would be the case if plants that manufacture bulbs would convert their manufacturing sites to a more energy efficient technology rather than send those jobs to China. To me, upper management and CEOs of these companies are the problem because they seem to think cheaper is better than quality and environmental impact. They can get a cheaper product from China. Republicans have displaced the problem, blaming the government for deciding what is best for the consumer, when they should be upset that the big businesses are not making the best decisions to protect the jobs. To me, the government should look to regulating the businesses and their practices. Retrofit the manufacturing sites to the newer product, train your workers to produce the new technology and stop sending jobs to foreign countries. From the environmental standpoint, I think we have to do something to save energy worldwide and this article about the UN proposals gives some very valid reasons. I really think we need to look at the bigger picture on the energy issue worldwide because it is all related and is going to have an impact on our food and water supplies in the end. Poorer nations are going to suffer the worst and if changing a lightbulb is a small thing that we can to do back off on our energy usage then I am all for supporting the change. Susie Morgan Wilburn • This entry was posted in Christmas, Family, Healthy Living, Holidays, recycle It, recycled items, too many things and tagged Christmas, Christmas lights, Electric light, Fluorescent lamp, Incandescent light bulb, LED lamp, light, Light-emitting diode. Bookmark the permalink.